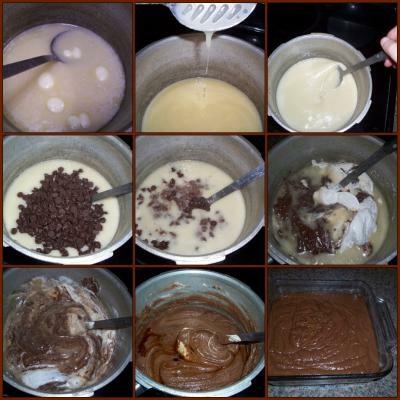 This is a homemade chocolate fudge recipe I have used over the years, handed down by my mom. It was always a big hit, made for Christmas, for my teachers! Heat sugar, butter & evaporated milk to full rolling boil in 3 quart heavy saucepan on medium heat, stirring constantly. Boil on medium heat until candy thermometer reaches 234 degrees, or until all graininess is gone, stirring constantly to prevent scorching, about 4 minutes. Remove from heat. Stir in chocolate chips & marshmallow creme until melted. Stir in vanilla and walnuts. Spread immediately into lightly greased 9 inch square pan. Cool at room temperature at least 4 hours. Cut into squares. Store in airtight container. Makes about 3 lbs. on this blog - she uses people pictures and posts with no credit to the real owners! Thank you so much for this delicious fudge recipe and for taking the time to share it. I especially love your photos! They are wonderful and a recipe in themselves. I've always had problems making fudge but this recipe looks so easy and the pictures make it so much clearer. Thanks, Roxanne, for taking the time to post the step-by-steps pictures.